Hello, sailor! This is my modern interpretation of a nautical look. 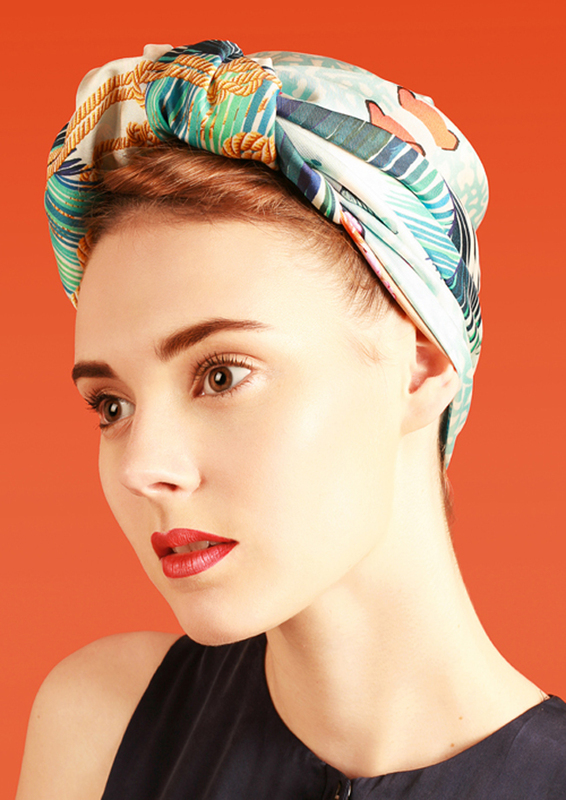 No need to collect shells: Tatty Devine made some printed ones to wear. 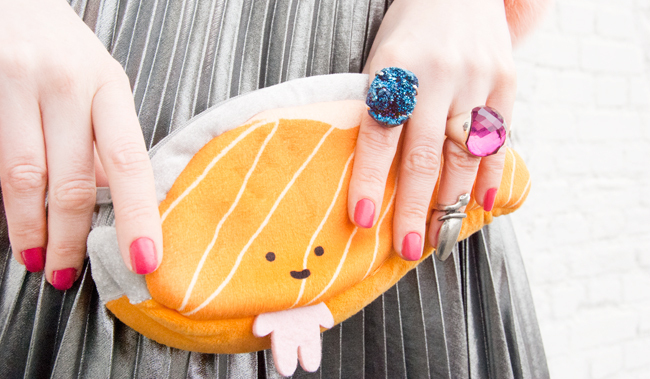 Nowadays, mermaids wear metallic skirts and like cute sushi bags from Japan. 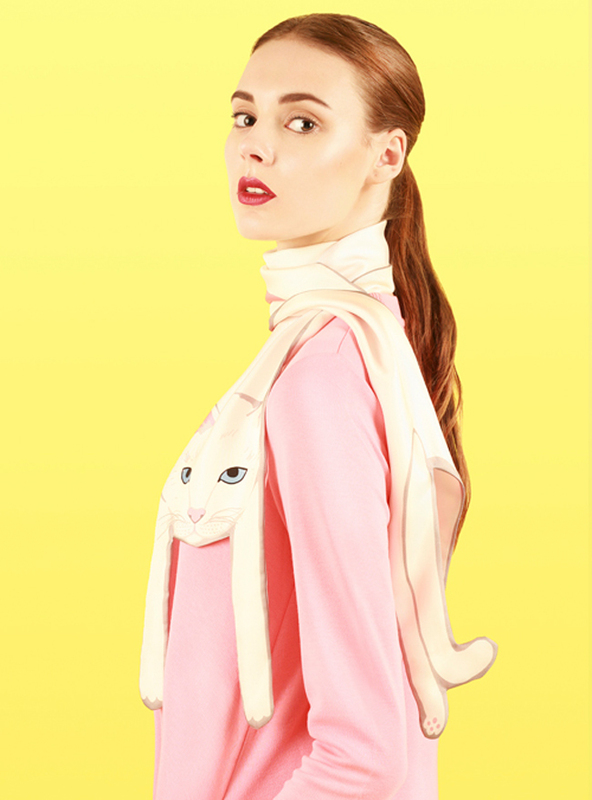 Scarf Magic: Not from under the sea, but from amazing Cléo Ferin Mercury. Kawaii: Yummy sushi to go. 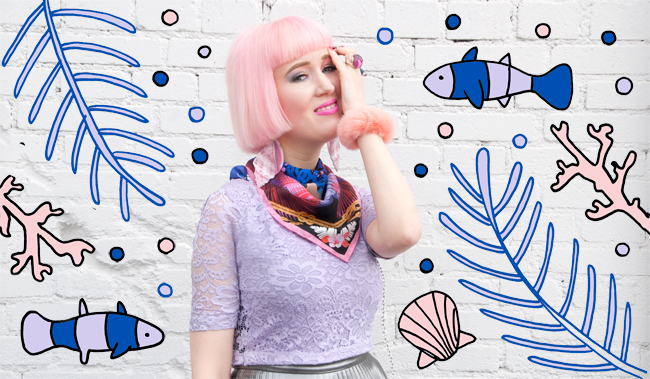 Lilac Lace: Mermaids might be afraid of fishing nets, but lace they love. Pure Love in Silk: Can't get over the prettiness of those colours. A Mermaids Dream: Does it involve a prince or having legs? We will never know. Shiny Silver: Did you expect golden treasures in heavy chests? I'm sorry, silver must do. So sailor, what do you say, will your ship come back to my harbour? How to style a nautical look without being cliché? This is what I tried today, so instead of stripes I wear a pleated skirt as my modern interpretation of a mermaid's tail. The look doesn't spot the classical blue and white nautical style, but a mixture of lilac, silver and blue. Metallic pieces go very well with a nautical look, just think of shiny treasures hidden in the depths of the sea. I know I'm such a dreamer, but I'll never stop my fascination for mystical creatures, no way! 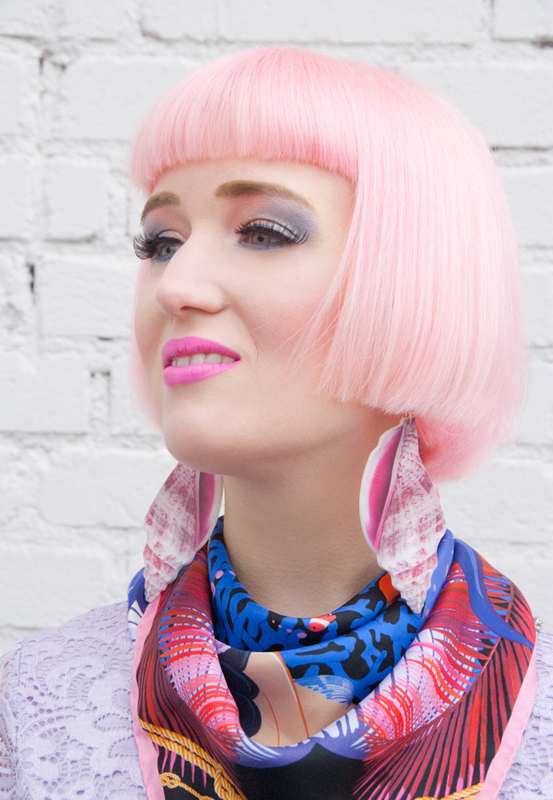 The highlight of this look is my silk scarf by Cléo Ferin Mercury (See my post about their SS15 Nautical collection here). The print is even better than in real, and my neck loves the good quality. I think this is a piece I'm going to keep forever. It's a perfect scarf for the current time between winter and spring, and I hope it will protect me from catching another cold while I'm living my dreams of being a fashion siren. 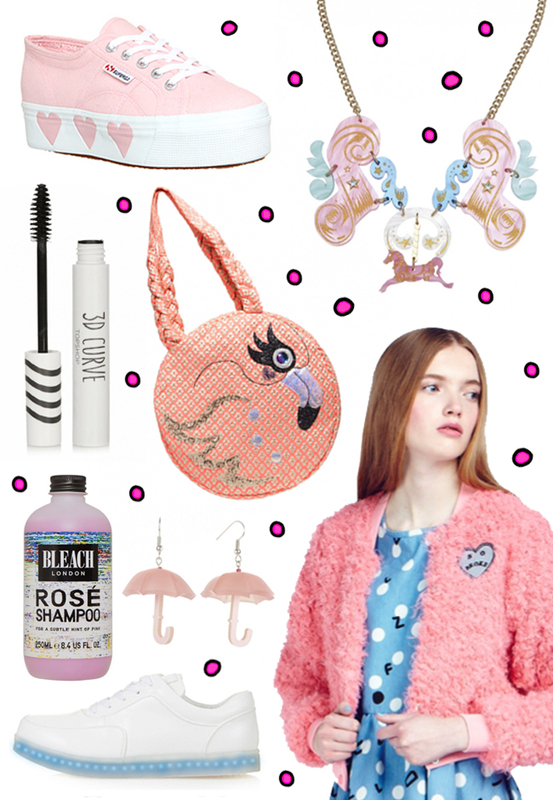 Tatty Devine Carousel Horse Necklace: No London trip without Tatty and this is so dreamy! Topshop 3D Curve Mascara: I think Topshop has extraordinary Mascara, so time to rebuy! Bleach London Rosé Shampoo: My secret to keep my pink hair colour for longer. 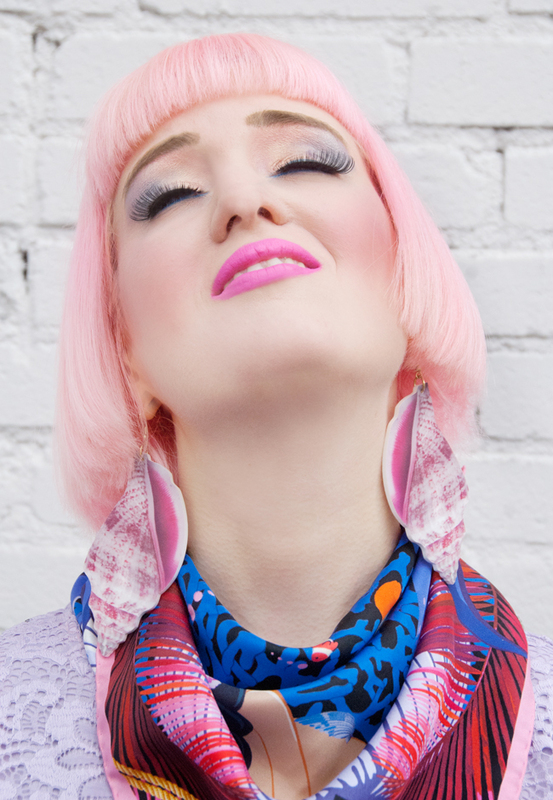 Tatty Devine Umbrella Earrings: Some say it's always raining in London. Topshop x Glow Trance Light Up Trainers: I always dreamed of flashing lights on my feet. 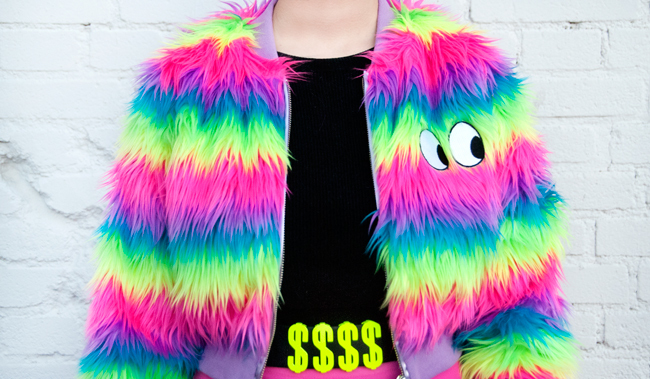 Lazy Oaf Fluffy Pink Bomber Jacket: Looks like made of candy floss and like a must-have! What couldn't you leave on the shelf from my wish list and what are your favourite shops or places in London? Are you also on the hunt for the one product that makes your skin absolutely flawless? I am, and this is why I love to test new skin care products, always in the hope they might beat everything I've known before. For the last two weeks, I tried three new products from Kiehl's – a face cream, a cleanser and an eye serum – and I'm happy to share my experience with you. Face cream and cleanser are from Kiehl's Clearly Corrective Collection, which promises to reveal a more radiant and luminous skin, correct dark spots and provide a more even skin tone. All products of this collection are free of parabens and fragrance. When I got the products I was a little bit surprised: According to the packaging, both cleanser and cream are developed and tested for Asian skin. Not my skin type, even if I am a big love of Asian fashion. Because I have sensitive and bright skin I thought they might work for me as well. 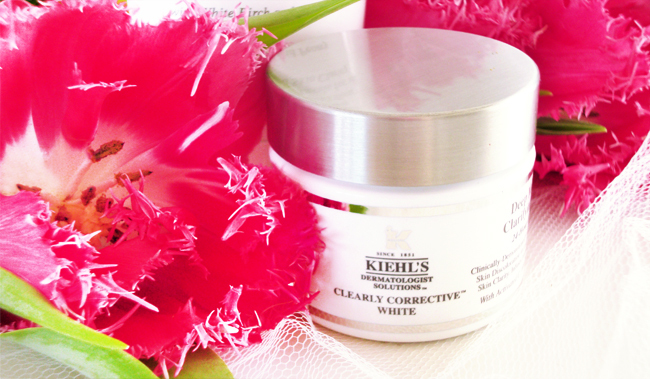 Let's see what Clearly Corrective can do for non-Asian skin! The packaging says: A gentle foam cleanser for day and night use. It removes makeup and impurities without stripping. 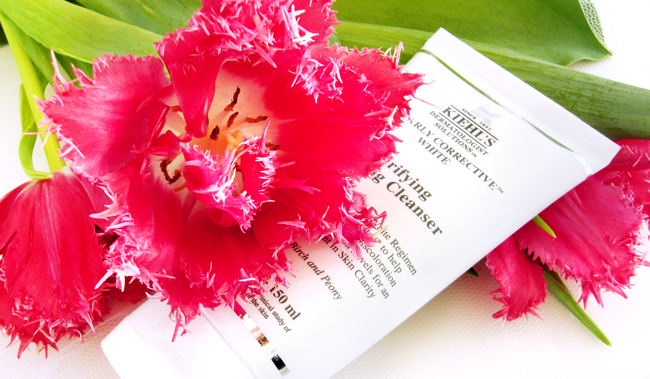 This cleanser makes the skin look more radiant and banishes discolourations. My opinion: A small amount of it is enough to have fresh and clean skin. I use it together with my Clarisonic brush in the eve, and I like that it doesn't leave me with itchy skin. It has a very subtle smell and a nice consistency. My skin looks brighter but not shiny after using it. Thumbs up! The packaging says: This cream claims to be lightweight, and a quickly absorbed moisturiser that will improve the clarity of the skin while providing a 24-hour hydration for instant luminosity and skin uniformity. It helps you to fight uneven skin tones and dark spots. My opinion: After applying it my skin truly feels refreshed and moisturised. The good feeling stays for the whole day. There are two little minus points: The first is the rather strange flowery-wooden smell (coming from the white birch in it). After a few days, I got used to it. Anyway, my skin likes this cream, and that's more important than what my nose says. The second minus point is that it comes in a pretty jar, but unfortunately without a spatula. I used one I already had and recommend you to do the same due to hygienic reasons. I will continue to use it and probably buy it again. While I can't say that my skin pigmentation changed dramatically, I think it keeps my dry skin very well hydrated without making it greasy. This cream is almost half as expensive as the one I usually use, which makes it even more attractive... There is no UV protection included, so don't forget to add additional suncream if you decide to give it a try! The packaging says: A 5-in-1 solution for your eyes: It lifts, firms, smooths, hydrates and restores the youthful shape of the eyes. According to their tests, 95% of women showed a significant improvement in eye-opening. 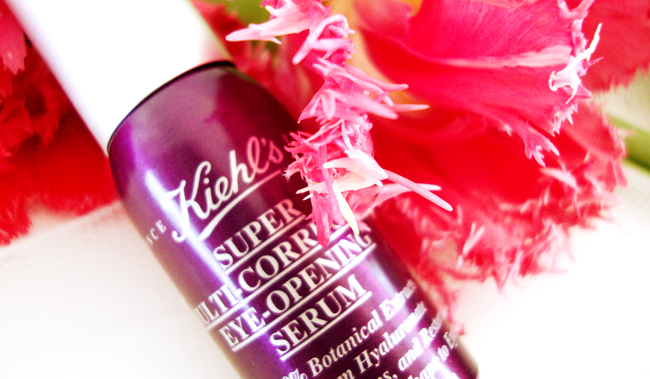 My opinion: While I am a true expert when it comes to eye creams, this is my first eye serum. It feels very lightweight, and I miss a little bit the nourishing effect my eye cream has. It's no problem to apply makeup over it, and this makes it a good product during daytime. I think I'll continue to use this for the day, but use it under my eye cream for the night for an extra strong effect. While I think it's not a miracle, it's far better than many eye creams I tried and worth a try. All products and more skin care available at Kiehl's. Have a happy day and don't forget to treat your skin well. This World Needs More Rainbows! 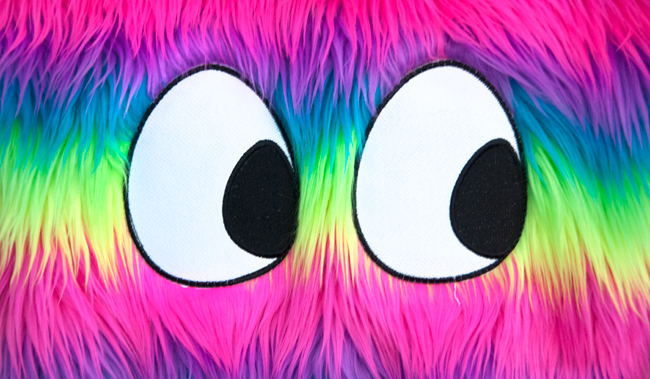 Say hello to rainbow fur. 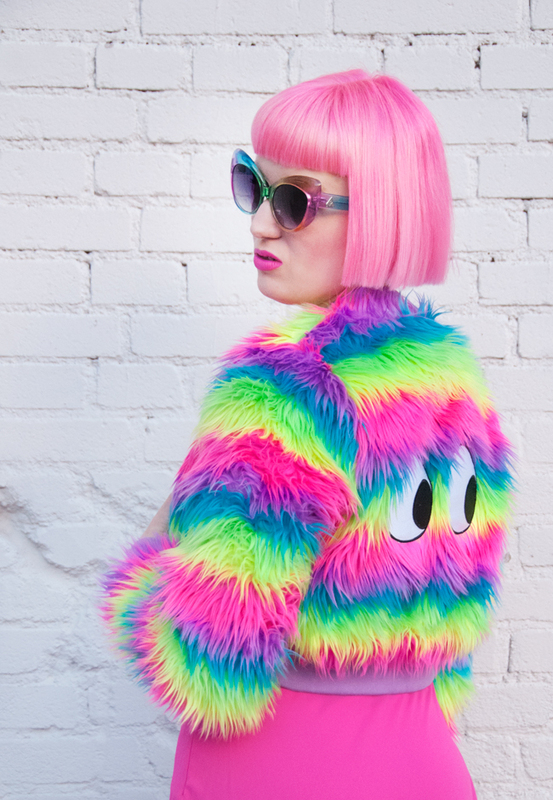 May it be the outfit of your dreams or nightmares, I love neon! No perfect looks without a lot of bling. And all it takes to make your legs seem longer is a skirt. How many colours has a rainbow? I say five! Freshly cut hair is my most important accessory. Colours, colours, wherever you look. Don't feel watched, it's just me! Why do we waste so much time with boring or insignificant things? We constantly worry about being not good, not pretty, not successful enough. We spend a lot of time with boring tasks. We drive to work in overfilled busses, full of distressed people who had to leave their dreams at home too early in the morning. Sometimes a day seems to be like the last one or the next one. I say stop! Break out! But how? 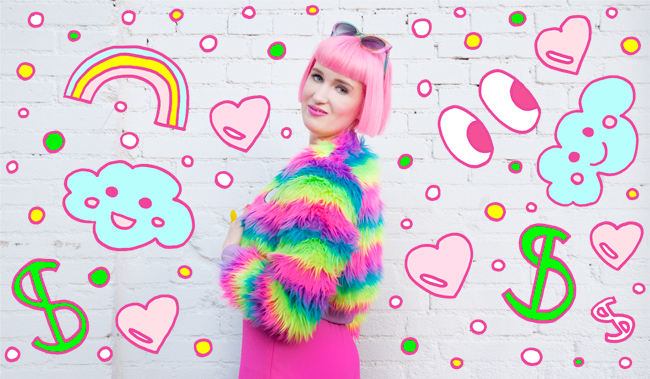 Just wearing a colourful jacket will not safe the world. But why not take it as a start? Do something you never did before, get bold! Be curious and don't fall into routine. Have a date with your boyfriend after spending years together, wear a colour you never dared to and most important: Don't take yourself and everything happening too serious. Yes, today I felt like wearing a whole neon rainbow, so what? You can love it, you can write my name on the list for the bad taste contest. I don't care, because I'm happy. Just smile! Do you recognise this blue-skinned flamingo girl? 100 points: It's me! A dreamy girl in a purple landscape: One of my favourite pictures from Robin Eisenberg. A mighty heroine, maybe from outer space? Look at those eyes! 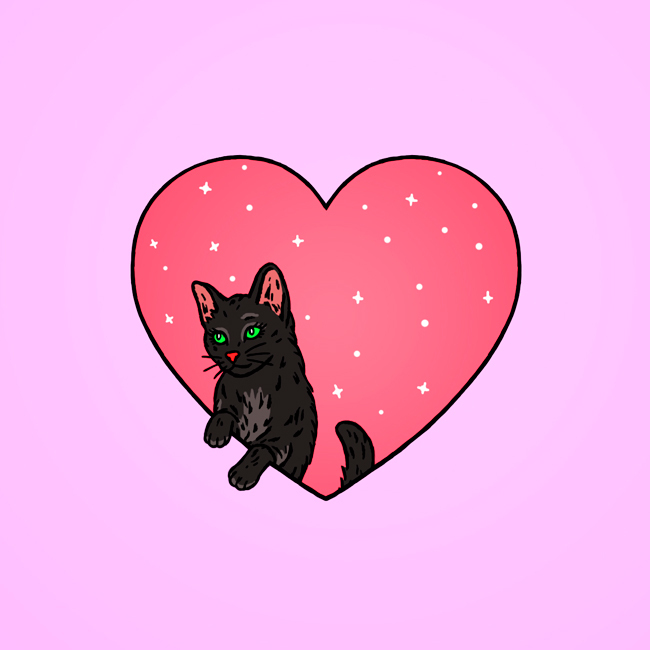 Whoever doesn't fall in love with this cat has no heart at all. Robin Eisenberg art for your home. Pimp your shower, sofa and your wall! Wow, one of my goals have come true: I've been drawn from a very talented young illustrator. I love the work of illustrator Robin Eisenberg so much, I just had to share it with you. Robin Eisenberg is an illustrator from Los Angeles. 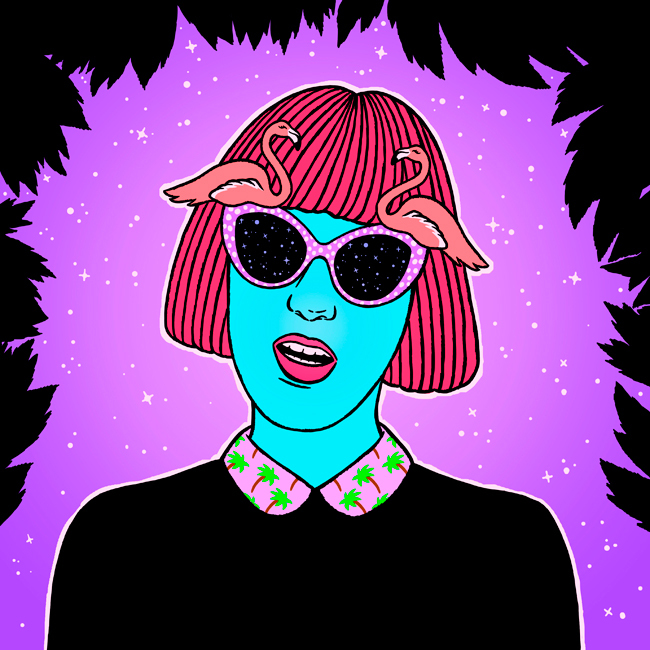 She describes herself as a nerd who likes Star Trek, letters and cactus plants. 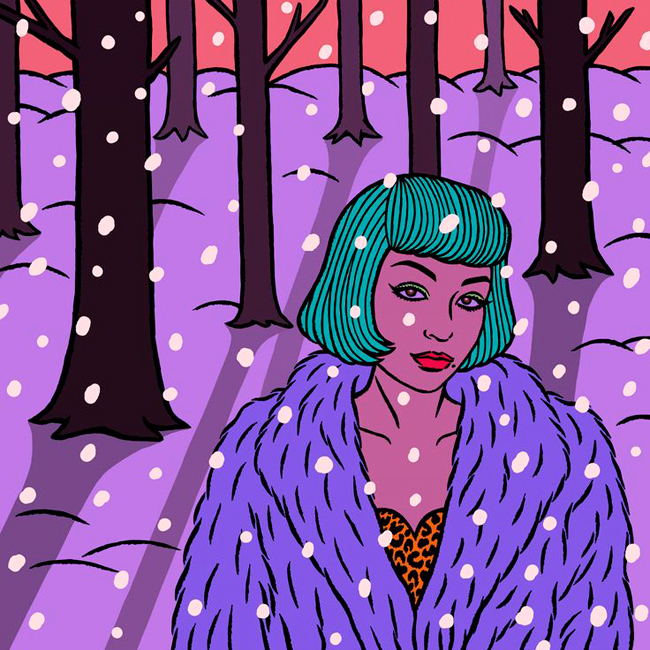 Her work is enormously vibrant and clearly comes with a cheerful 80s influence. It's easy to guess that Robin must have grown up with My Little Pony and Lisa Frank. While Robin has been drawing for her whole life, she only decided five years ago to try it as a job. Since then she did quite a few album covers and other work for bands, as well commissioned work for magazines. Very often she paints cool babes or yummy food such as pretzel or chocolate covered strawberries. Personally, I always get hungry when I see her avocado and pizza prints. 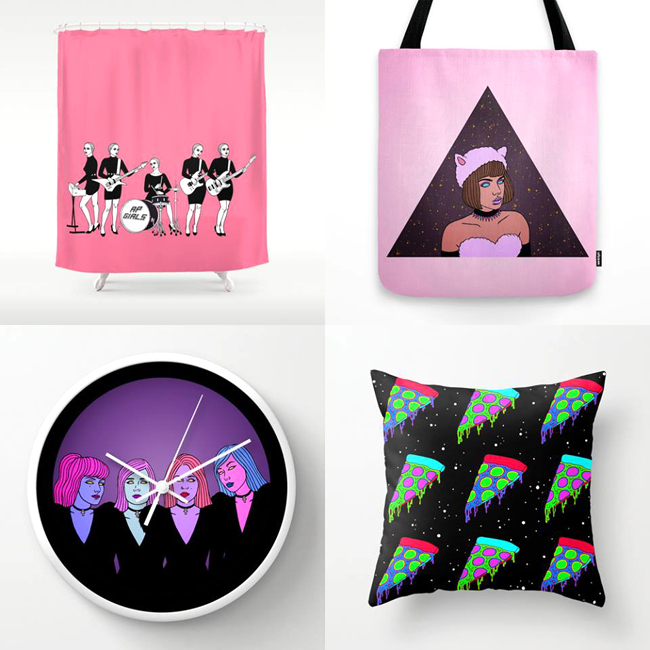 Fortunately this mega babe has a shop as well, so we can all own bed sheets, pillows, phone covers or even shower curtains, featuring the illustrations. Visit Robin Eisenberg's page and shop her things here. Copyright of all pictures by Robin Eisenberg. As a little girl, I loved the scarf drawer of my grandmother. I often touched the smooth fabrics of her scarves and was fascinated by their patterns. My grandmother used to wear them around her neck and to protect her hair. For a very long time, I thought that silk scarves are attached to ladies of her age and only had nostalgic feelings regarding them. I rediscovered them a few years ago, when amazing designers like Cléo Ferin Mercury appeared with updated stylish designs fit for a contemporary audience. I am seriously thinking about starting my own silk scarf drawer. Granny would be so proud of me. Cléo Ferin Mercury is an independent designer, based in London. 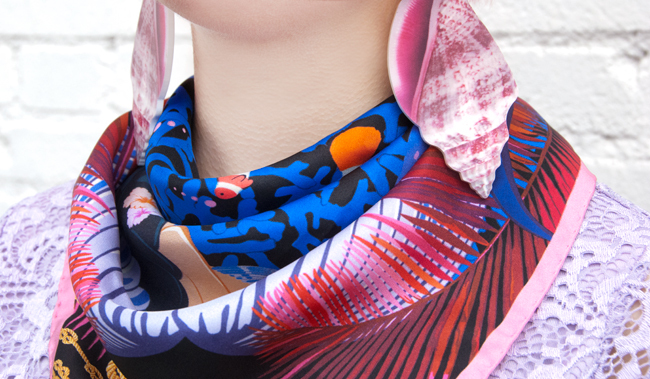 Her hand-rolled silk scarves are made with a lot of attention to detail and come in bold designs. If you are not a scarf type, maybe you will reconsider after seeing those amazing designs. 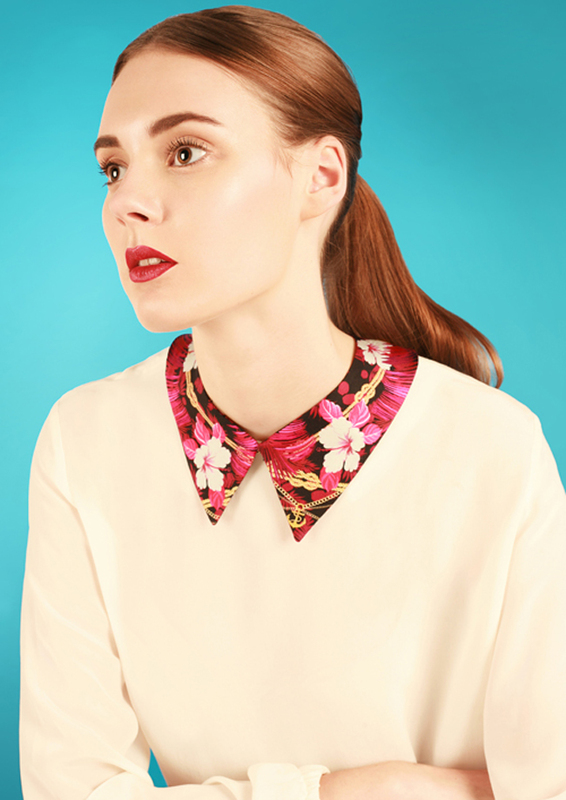 Otherwise, you will find cute detachable collars to make your heart beat faster. The theme of the SS 2015 is "Nautical" and takes us to a mystical place deep beneath the sea. 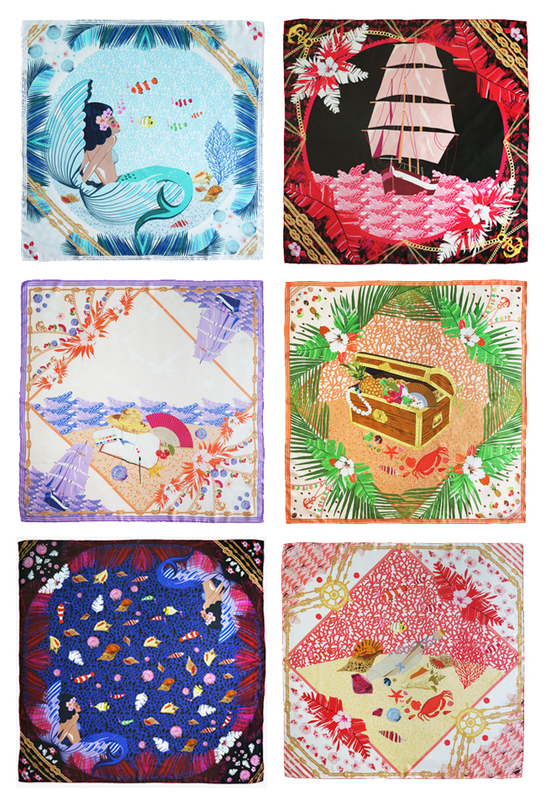 Pretty mermaids emerge from their seashell beds and meet colourful fishes while majestic ships battle against the waves with their sails hoisted. There are treasure chests to be discovered as well as beautiful shells. All you need to do is just to dive in! Visit Cléo Ferin Mercury's page here and don't forget to like this lovely designer on Facebook. Copyright of all pictures by Cléo Ferin Mercury. 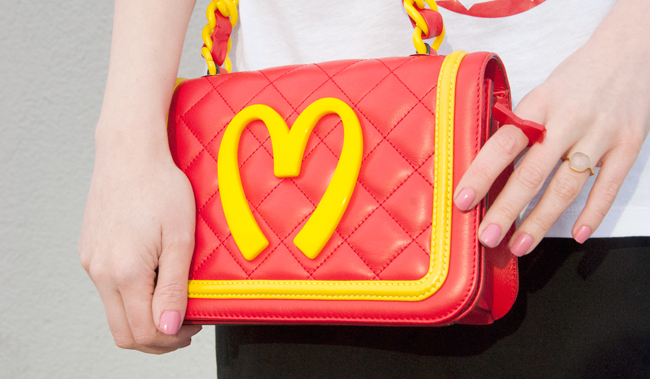 McDonalds Love: This is where good style meets bad taste. 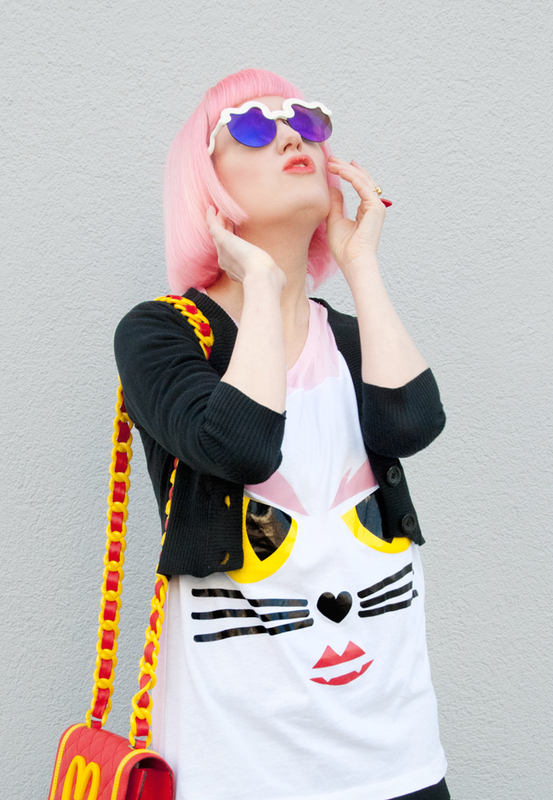 Fast fashion for me and a milkshake for Choupette, please! This outfit was just missing a Big Mac, so I ordered one. 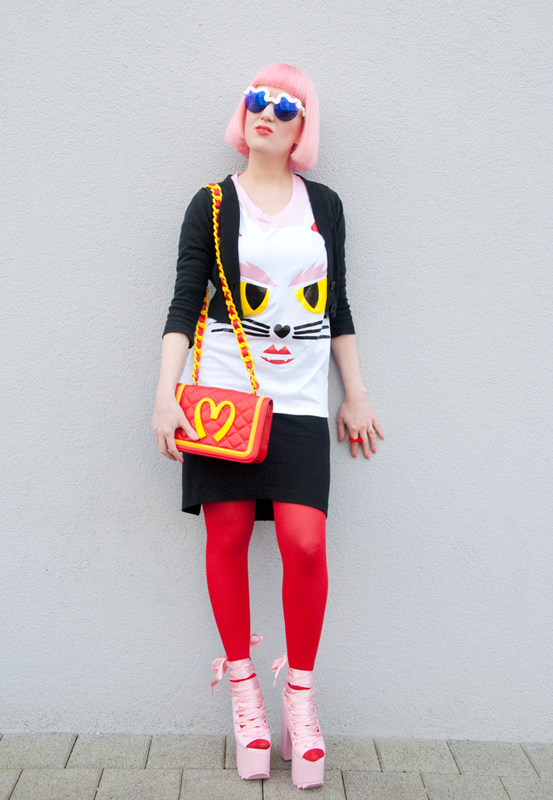 Best advice to continue to look slim while eating fast food: Wear the highest shoes you find. 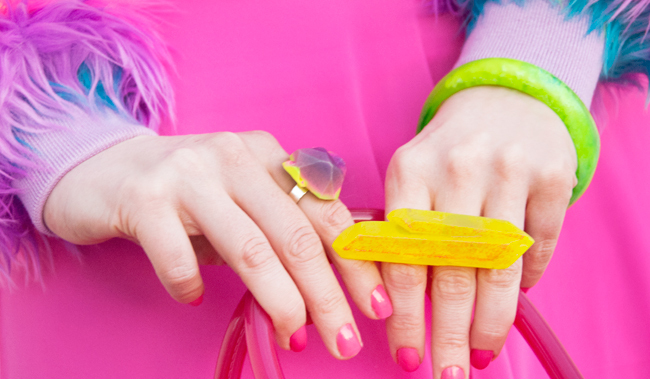 Yummy, Yummy: What a bright look! Pink Hair Don't Care: And it even goes with red and yellow, you see? Dinner is Served: The cats are starving. 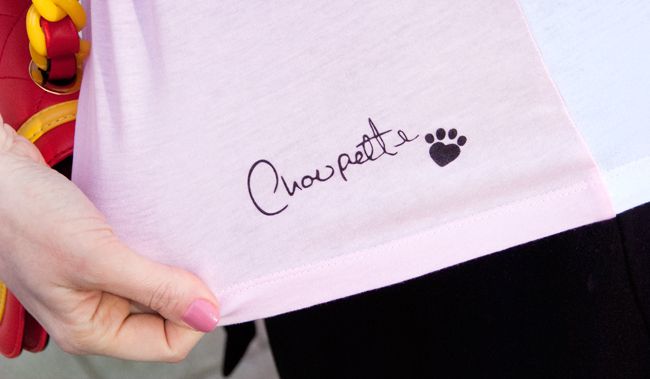 I Am Such a Groupie: Wearing Choupette's signature on my back. Monster Cat: Karl thinks she can be nasty, I think she is just cute as a button. Moschino and Karl Lagerfeld in one look, impressive isn't it? 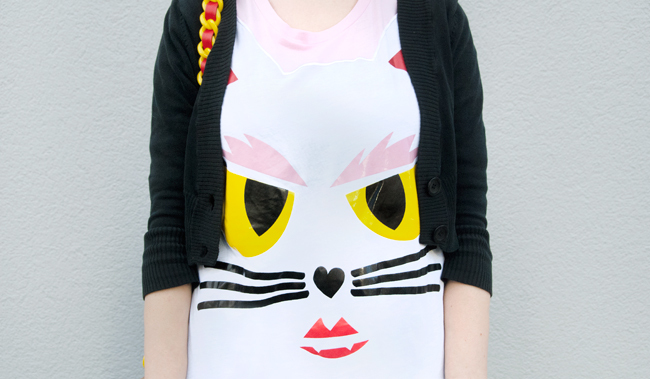 Sometimes even the lovers of independent designers – such as me – fall for the major labels… Carl wants to marry his cute cat Choupette, so how do you think I could resist having her on a tee at least? The tee was a gift from my darling, he said that it just belongs to me. I wanted to show it to you since I got it, but it was so cold during the last weeks. Finally I was brave enough to step outside with it. The Moschino bag was a gift from me to myself, I just couldn't go on without this fashion milestone from Jeremy Scott in my life. I am a humble girl and I still feel bad if I spent a lot of money on fancy things and I certainly don't need expensive things for my ego. I feel so astonished that this bag is mine and expect it to vanish again every moment like an air built castle. But whenever I open my eyes again, it's still there. Thank you life, I love you, you are so good to me! I never go to McDonalds to be honest. 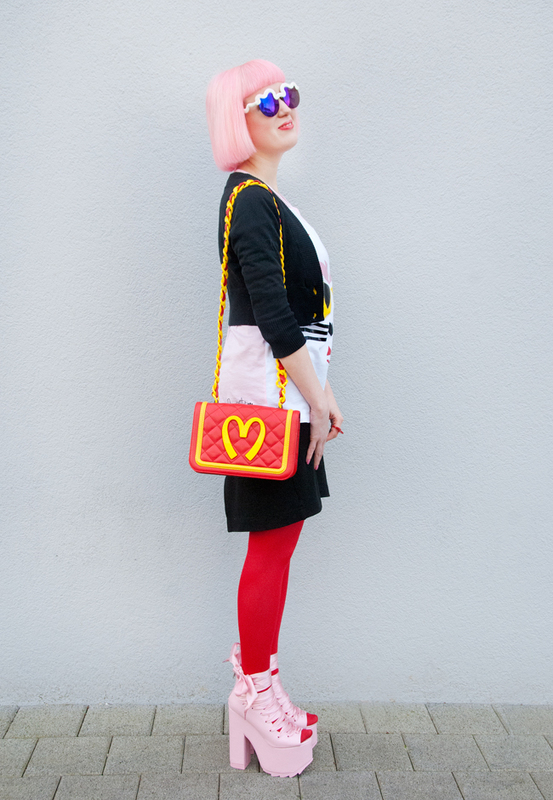 Isn't it sweet irony that a fast food inspired bag won over my heart in a storm? 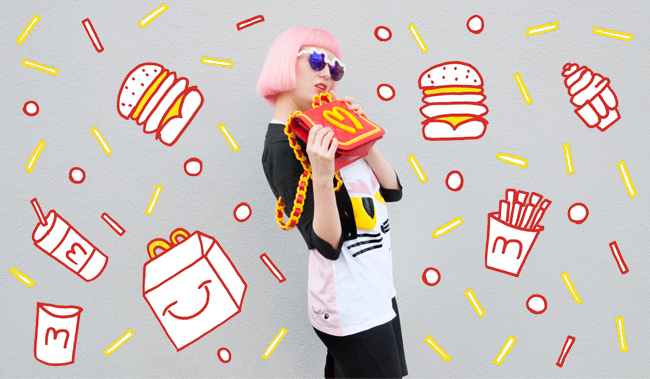 McDonalds is an icon of pop culture for me. The red and yellow signs from the fast food chain (which have been replaced by green ones) remind me of the nineties, when fast food was so cool over here and we've been excited to spend our birthdays in the place with the big yellow "M".